There is truly nothing that makes my heart happier than Spring (well maybe puppies)- but Spring sure does make me happy! 🙂 All the gorgeous colors are hitting the shelves, florals are everywhere, and I can’t get enough! I thought today it would just be fun to round up some favorites- from a new swimwear line to fabulous dresses… Find out what’s in my cart & what has arrived on my doorstep! Next, an old-fashioned “what’s in my cart” or more realistically “what’s now in my closet!” If you want to see how these pieces look in real life, hop on over to my IG Stories where I’m doing a fun try on session for y’all! You’re not going to believe how gorgeous these pieces are! Patterned Shirtdress (Size Small)- I am coco for Cocoa Puffs over this dress too! It just sings “Spring! !” and I can’t think of a more perfect piece for the office. I love all the details throughout it and 100% think you need it in your closet. Sleeveless Ruffle-Trim Shirtdress (Size Small)- This is the same silhouette as the navy dress above, but in a stiffer/more structured fabric. No surprise, I love this one just as much! Definitely would be darling with wedges for a brunch date as the weather warms up! Lace-Up Swing Dress (Size Small)- I always keep an eye out for these easy swing dresses because they are just the perfect piece for all seasons. I had a navy one this fall that I LIVED in, so when they came out with this blush pink version for spring I jumped! At less than $15 you cannot go wrong (plus it comes in about 6 other colors if pink isn’t your thing! What have you started scooping up for Spring? If you love the dresses above you can get 30% off today only (no code needed)! Previous Post I Heart You! 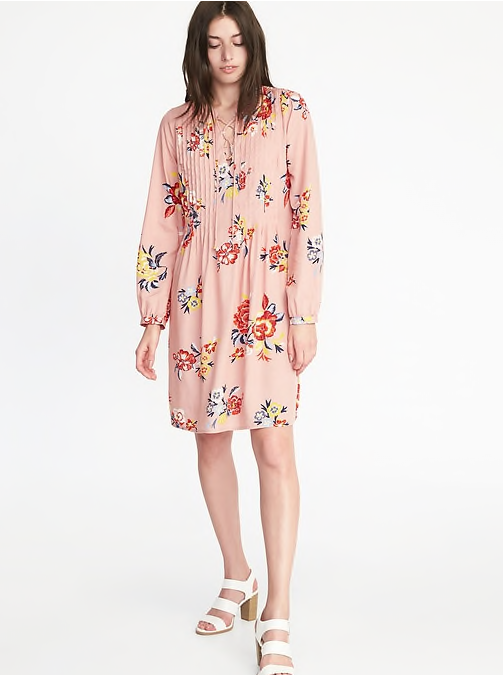 I really like the first shirt dress! 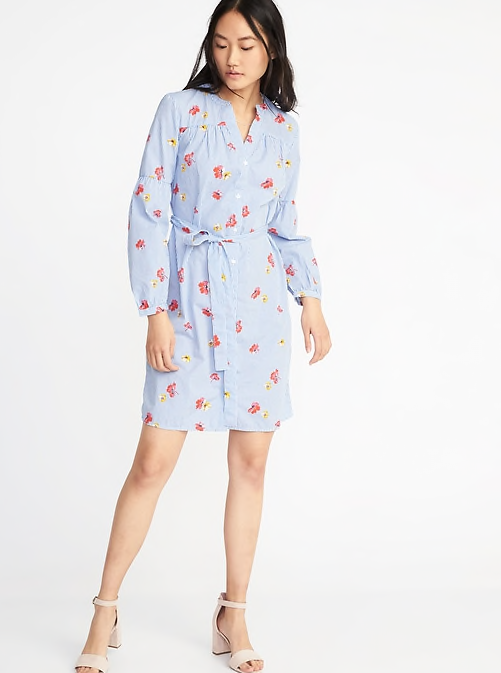 Oh I like that shirt dress, the print is cute and I love that it’s navy! I also like that there are 2 different prints for the same style. Those swimsuits look so cute and perfect for vacation or (obviously) the summer time! It’s been WAY too long! I’m so glad its back!